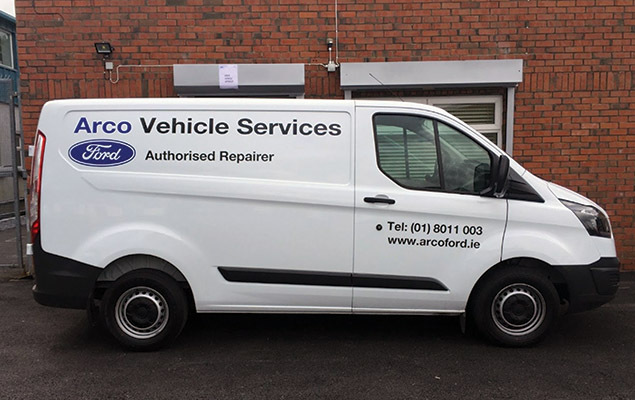 Established in July 2004 in Dunshaughlin, Co. Meath, Arco Vehicle Services was recently appointed as a Ford Authorised Repairer serving counties Meath, Dublin and Kildare. Managing director Paul Sweeney explains more. A desire to branch into ‘mainstream’car and commercial vehicle servicing and repairs led to Arco Fleet Maintenance Ltd –trading as Arco Vehicle Services –applying to Ford to become one of their authorised repairers in the latter part of 2014. After meeting all of the car dealer’s strict criteria, Arco was appointed as the country’s newest Ford Authorised Repairer on May 30 of this year. “We are proud and delighted to act as an authorised repairer for Ford. We are entering a new and exciting phase with this appointment. As a fleet maintenance centre up until now, it made sense for us to represent Ford because they account for 20 per cent of the car / van fleet rental market and 25 per cent of the commercial sales market in Ireland,”Paul says. Arco Vehicle Services clearly ticked all of the boxes needed to join an exclusive club of stand-alone Ford Authorised Repairers. “There are only five of us in the country,”points out Paul, who has ambitions to become a main Ford dealer in the future. Arco operates a state-of-the-art vehicle service and maintenance centre which boasts a service workshop with six bays, the most up-to-date Ford diagnostic equipment and special tools. It also has a three-bay auto body shop with a low bake oven and a water-based paint scheme. Its location in Dunshaughlin Business Park on the Old Dublin Road offers easy access to and from the nearby M3 motorway. The garage promises complete customer satisfaction with high levels of care and attention from its highly-qualified and trained staff. Customer care manager Paddy Mulligan and the rest of the friendly Arco team aim to make your experience a pleasant one. Arco’s technicians will help to keep your Ford in top condition and safe to drive, while also maintaining its resale value. You can expect value-for-money and high-quality parts from the people who know your vehicle inside out. All technicians are trained by Ford, whose quality control ensures quality results, while Ford Original Parts are always available and all repairs carry a warranty. You can spot a Ford Original Part by its distinctive trademark, which is often displayed in a prominent position. Arco offers the right service solutions for vehicles of all ages and will deal with your insurance company if required. As a Ford Authorised Repairer, Arco provides Ford motorcraft service, Ford Blue service, a tyre centre, Ford Sync and Breakdown assist. The garage also offers body repairs to the highest quality on all makes of vehicles, carrying out all types of bodywork for private customers and insurance claims. Services in this regard include major and minor bodywork repairs, plastic and aluminium repairs, air conditioning services, electronic paint matching system, low bake oven and environmentally-friendly water-based paint scheme. In addition, a range of the latest model replacement vehicles, varying from small cars to light commercial vehicles, are available at very competitive rates to car owners with fully comprehensive insurance only. A free collection and delivery service is also available to customers living in the locality. The company’s original name was Secure Fleet, which reflected its expertise in building and maintaining cash-carry vehicles. On becoming a fleet maintenance centre for cars and light commercial vehicles, it changed its name to Arco Fleet Maintenance before rebranding to Arco Vehicle Services this year. Arco carries out maintenance for leading car and van fleet hire firms such as Avis, Enterprise Rent-A-Car and Budget. It also maintains vehicles for the Leixlip, Co. Kildare-based Lifeline, which is the largest private ambulance operator in Ireland and the second largest ambulance service after the HSE’s National Ambulance Service (NAS). Arco Vehicle Services is open from 8.30am to 5.30pm Monday-Friday. Why not give them a call?